4 Comments on Ahhhhh, baby, baby…..Watch Out! Hi, Fern signing in; today is Saturday 4th September and we’ve had a lovely week. Sam and Philemon joined us yesterday, much to our surprise, so apologise for not writing on my blog! Sam’s dad went away again – we are thrilled as now we can spend some time with him but he was disappointed that his father had another business trip planned. Since his mom passed away from cancer Sam has not seen much of his dad – really sad. Philemon is Nao’s blood brother (for those of you who haven’t viewed the website). Nao was adopted by my parents when she was two years old. Her natural mother, Mama Joyce is our nanny and house-keeper and we all adore her. Boy, can she move! Her nickname is ‘Big Mama’ and for a good reason – she is of ample-size (Nao says I’m being kind!). Well, if you have made Mama Joyce angry you will know what I mean – she moves at incredible speed and normally has some sort of kitchen utensil brandished in her hand as a weapon; lots of laughs when she is chasing some-one else. As mentioned in my last blog I’ll carry on with the other animals we viewed on our game-drive on Wed. Isaac stopped the land-rover suddenly as he had sighted movement on our left; seconds later the beginning of a herd crossed the sand road. 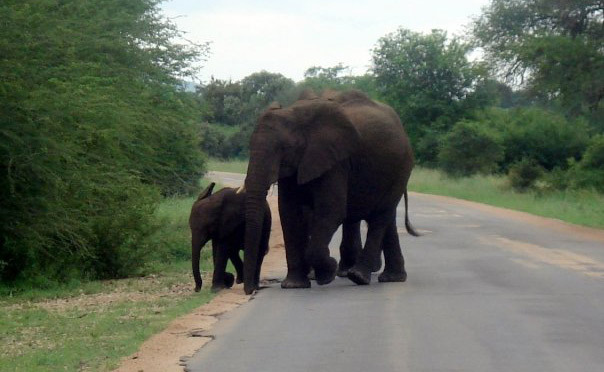 Even though the game are used to vehicles they can still be temperamental, especially if they have young; well you can see mum and calf then made their way towards the road , following the other three. The caring mum then stopped so that her calf could suckle; just so gorgeous! It doesn’t matter how many times Nao and I have viewed the wild animals on Imanga; we are still always left in awe by their beauty and perfection. We were so focused on our ‘ahhhh’s that we didn’t notice our ‘Oh No!’ emerging from the left, ears flapping madly; shortly after this photo was taken she lifted her trunk and trumpeted loudly. If their ears are flapping it is generally a warning and could result in a ‘mock’ charge but, seriously, in the African bush, take no chances!!!!!!!!!!!!! Fern, signing off, time for bed – Mama Joyce has been telling Nao and I to go to bed for the last hour but I’ve been busy with this and Nao has been nattering to the boys – just had a pillow thrown at my head by my darling sister; we can hear Mama’s heavy breathing as she clumps up the stairs…. Sam has made a quick exit to his bedroom and Philemon is hiding in the bathroom until she has gone then we are going to have a midnight feast…..
P.S, Just in case you are wondering, Mom and Dad have gone away to a conference for the weekend so……. Thank you, you have made my day – I will have another up later today with more photo’s of our darling ‘Fern’! Your support means a lot to me! Good to see Fern up to a bit of mischief while the rents are away!!! A true teenager. I find myself coming on here every few days now to see her latest news! Keep it coming! So sorry Allison, trying to get the books published at the moments but will keep writing extracts on the website and adding new blogs each week from Fern – please keep commenting as then we will be able to generate interest in getting the series published – really appreciate your support! Hi, read your book extracts with interest. I would be interested in buying your novels so please let us know where to get them from. Love Fern on her youtube videos, she’s funny! ← Previous Post: Nao taking a spinning class; NO! Nao making a getaway; YES!